The outstanding play of D-backs outfielder Gerardo Parra has turned some heads this Spring. After arriving to camp in stellar shape, Parra is enjoying the best Spring Training of his young career. He has emerged as a regular in manager Kirk Gibson’s lineup, and produced when given the opportunity. Parra is currently boasting a .350 batting average to go with his two homers and 10 RBI. It was more of the same for Parra on Friday against the Mariners. In his first at-bat, Parra drilled a single into center field to plate the D-backs first run of the game. After being hit by a pitch in his second plate appearance, Parra raced around the bases to score on Willie Bloomquist’s single. Gibson believes the impressive results are due to Parra’s hard work this Spring. Gibson believes Parra is noticing the results of his new workout habits. 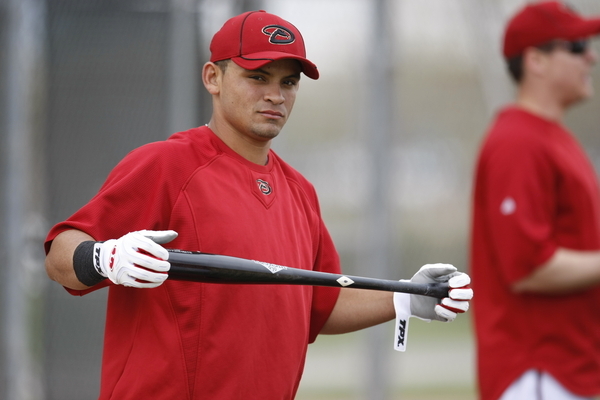 Since his arrival to the Major Leagues in 2009, Parra has seen regular playing time as the team’s fourth outfielder. Through his first two seasons in the big leagues, Parra is a career .277 hitter with 40 doubles. However thanks to his impressive Spring, Parra could possibly receive the majority of innings and at-bats in left field this season. While Parra could play center field to give Chris Young an occasional day off, Gibson believes his skills best suit him for the corner outfield spots. Since Gibson took over as D-backs manager, he has stressed the importance of adequate defense. On Friday, the Mariners kept first baseman Brandon Allen busy fielding his position. Through the first three innings, Allen hauled in four batted balls, fielding them with ease to retire each Seattle hitter. Allen even turned in a highlight reel catch by diving to his right to snare a Josh Bard line drive. For Allen, defense could prove to be a deciding factor for the young D-back as he continues to fight for playing time at first base. As Spring Training progress, the D-backs continue to focus on strong defense as a team. Allen said he’s just glad to contribute in the field. In the top of the seventh and with the score knotted at 4-4, Juan Gutierrez toed the rubber against the Mariners in his seventh outing of the Spring. He made short order of the Seattle lineup by retiring the side in order. The right-hander induced a ground out to first base off the bat of leadoff man Gabe Gross to start the inning. Mike Wilson was next and he didn’t fare much better as Gutierrez induced another ground out. One batter later, Gutierrez struck out Josh Bard to cap off the 1-2-3 frame. Friday’s inning against the Mariners was Gutierrez’s fourth consecutive scoreless outing. With less than three left in Spring Training, the position battle at first base still appears to be wide open for the D-backs. The trio vying for playing time: Juan Miranda, Russell Branyan, and Brandon Allen all continue to hit well. It was Miranda who stood out in Wednesday afternoon’s game against the Angels. He received the start at first base, and took advantage of the opportunity. In the bottom of the fourth inning, Miranda launched a long two run home run to right field. That long ball was his third of the Spring. Miranda now owns a .294 batting average to go with a .618 slugging percentage. In his third plate appearance, Miranda rocketed a single back up the middle in the fifth. Miranda made it a three hit afternoon by hitting a leadoff single into right field to start the bottom of the eighth. It was a big offensive day for Miranda, who had cooled off a bit at the plate recently. 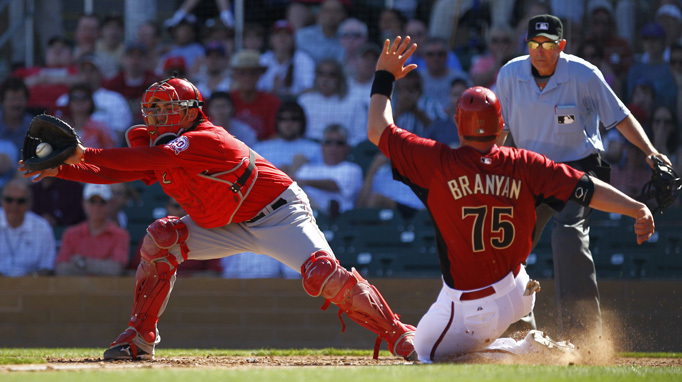 Branyan entered the Spring as a non-roster invitee, but has proven himself to be a threat at the plate. The left-handed hitter has collected 16 hits, nine RBI, three home runs and an outstanding .794 slugging percentage. Against the Angels, Branyan pinch hit in the bottom of the fifth, and continued his hot hitting by lacing a single into right field. After advancing to second base on a wild pitch, he would then score on Chris Young’s single. As camp progresses, Branyan continues to make a statement for inclusion on the roster. Allen has been off to a strong start at the plate this Spring as well, batting .343 with four doubles. 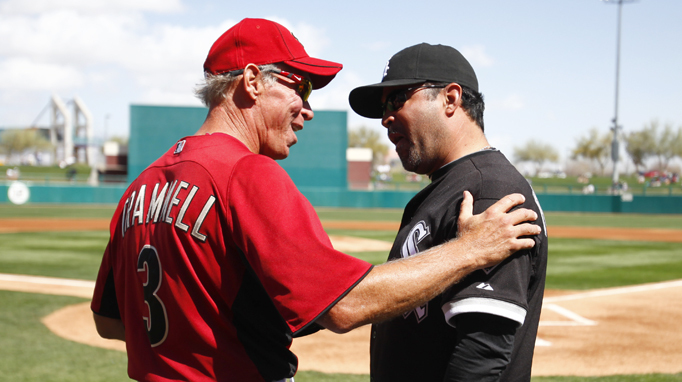 The D-backs took on the Chicago White Sox at Kino Stadium today, as the teams who once shared a facility in Tucson reunited in the Old Pueblo. Proceeds from the game benefitted the Christina-Taylor Green Memorial Fund. The fund was established at the Community Foundation for Southern Arizona by the Green family to receive gifts in memory of Christina. “Right now, we’re going to build a playground at Christina and Dallas’ school, Mesa Verde Elementary,” Roxanna Green said. “That’s something they desperately need. They’ve had the same playground equipment for years and years and years. We’re going to replace the PE equipment — possibly buy smart boards, computers, and a lot of companies hopefully will step forward and help us out if they’re willing to let us purchase it at cost so we can provide as much as we can for the children at the school. A crowd 7,419 was on hand to see the White Sox beat the D-backs, 12-1 (a D-backs split squad unit also played in Surprise against the Kansas City Royals, winning that game 8-6). Our photographer, Jordan Megenhardt, was at the game in Tucson. Here are some of his images.? It was a perfect day for baseball at Salt River Fields on Friday as the Arizona Diamondbacks hosted the San Diego Padres in front of a sellout crowd. In his second outing of the Spring, Ian Kennedy made it look easy on the mound as he mowed through the Padres’ lineup. Kennedy is counted on to be an important piece of the D-backs rotation once again this season, and the right-hander clearly threw well on Friday. In the first inning, Kennedy allowed a leadoff single to Eric Patterson, who was then caught stealing by D-backs catcher Miguel Montero. Kennedy struck out Jason Bartlett looking and retired Orlando Hudson via a groundout to first base. Kennedy said his command was much improved from his first outing. Kennedy also said he has been watching film of his previous starts to gauge where his tempo and rhythm was. In the top of the second inning, Jorge Cantu grounded out to third for the first out of the inning. Kennedy then froze Chris Denorfia on a breaking ball for a strikeout. Jesus Guzman singled to center, but was stranded as Kennedy responded by getting the last out of the inning on an Aaron Cunningham fly out. Kennedy’s third and final inning was even more impressive. The first two batters of the inning: Guillermo Quiroz and Tim Stauffer both struck out. Patterson then grounded out to cap off the 1-2-3 frame. That would be all for Kennedy as he finished with a final line of three innings, two hits and four strikeouts. Among the many D-backs prospects that have taken the field this Spring Training is third baseman Bobby Borchering. The former 2009 first round draft pick is starting to see more time at third base and in the batter’s box. In Friday’s matchup against the Padres, Borchering laced a two out single into left field in the bottom of the fifth. Borchering hopes to take advantage of the opportunities to play in the Major League games. Last season, Borchering posted a .270 batting average with 15 home runs and 74 RBI while playing for Single-A South Bend. For his first full season in professional baseball, Borchering felt like it was a great learning experience. With his the start of his regular season over a month away, Borchering has high goals for the rest of Spring Training. 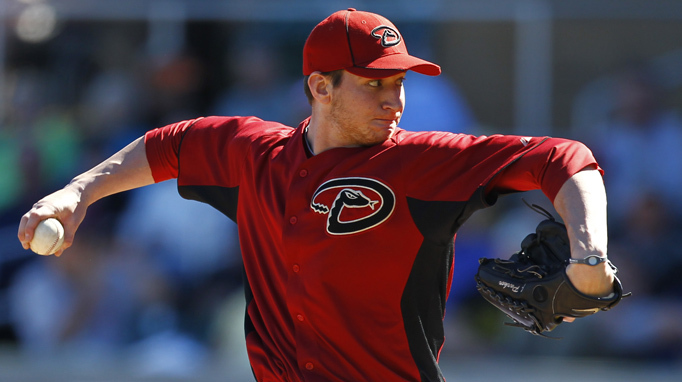 After making his 2011 Spring Training debut last week against the Colorado Rockies, D-backs pitcher Jarrod Parker returned to the mound on Thursday against the Padres. The highly regarded prospect pounded the zone with strikes and threw two scoreless frames. With a 3-2 lead, Parker entered in the bottom of the fourth, and battled to a full count against Padres leadoff batter Luis Durango. Parker then retired Durango on a ground out to second base. One batter later, Eric Patterson reached third base on a double and a stolen base. But Parker set down Chris Denorfia and pinch hitter Aaron Cunningham on fly outs to third baseman Geoff Blum, and got out of the inning unscathed. Similar to his first outing, Parker was able to tighten up and keep the opposing offense from scoring. Parker’s energy level certainly seemed rock solid when he returned to the rubber in the bottom of the fifth for his second inning of work. He picked up where he left off the inning before by retiring Chase Headley on a ground ball to Ryan Roberts at second base. The next batter, Nick Hundley, didn’t fare much better as he flew out to left field. After allowing a single to Oscar Salazar, Parker got Kevin Frandsen to fly out to center field to end the inning. While Parker allowed three walks in his first outing, he did not issue a walk against the Padres. In his two innings, Parker threw 31 pitches, 20 of which were strikes. With Spring Training still in its early stages, Parker hopes to build off of each of his outings. 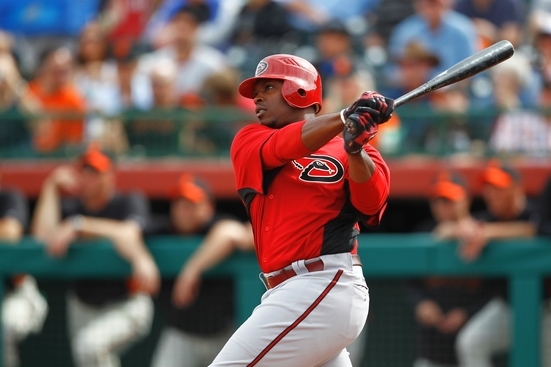 Most opposing pitchers are aware that when D-backs outfielder Justin Upton puts the barrel of the bat on the ball, it tends to go a long way. After doubling twice on Wednesday, the D-backs right fielder provided plenty of offense against San Diego on Thursday. Against the Padres, Upton singled in his first at-bat. Then in the top of the fourth inning he unloaded on a Greg Burke pitch, driving it into the left-field lawn seating for a two-run homer. That blast was Upton’s first home run of the Spring. While Upton has had a nice week at the plate, he is still not where he wants to be. With high expectations heading into Spring Training last season, A.J. Pollock saw his season lost almost immediately due to a fractured growth plate in his right elbow. 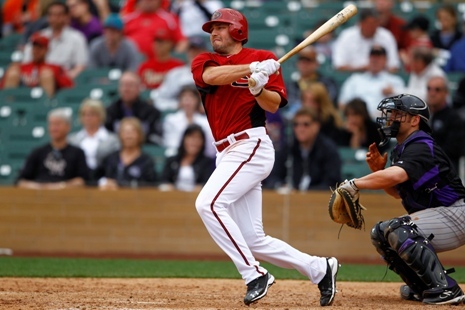 A year later, Pollock has returned to the diamond for the D-backs. In Wednesday afternoon’s contest against the Seattle Mariners at Salt River Fields, Pollock got the starting nod in centerfield and played all nine innings. His presence was immediately felt as the speedy outfielder raced into shallow centerfield to dive and catch the third out of the first inning. Pollock stepped to the plate in the bottom of the third inning and again showed off his speed by beating out an infield single. After striking out in the fourth, Pollock rebounded by drawing a walk against Seattle’s Edward Paredes. In his final plate appearance of the afternoon, Pollock followed a Wily Mo Pena single with a single of his own down the left field line. Pollock later scored from second base on a Paul Goldschmidt hit. After a strong first Spring start, Pollock is eager to continue his early success. While it was only one game for Pollock, it’s clear why the D-backs think highly of their former first round pick. The D-backs have long known that Leyson Septimo owns a talented repertoire of pitches and a dominant fastball. It was all a matter of putting it all together on mound for the southpaw. Against the Mariners, Septimo certainly looked like he’s headed in the right direction. Septimo took the mound in the top of the seventh, and faced Michael Saunders to lead off the inning. He then quickly retired Saunders on a fly out to right field. One batter later, Brendan Ryan smacked a ground ball back to Septimo who fielded his position well by hauling in the comebacker and throwing on to Juan Miranda at first base for the out. Septimo then got Johermyn Chavez to ground out to third base to cap off the 1-2-3 inning. Septimo has struggled with command since converting to pitching in 2008, last year in particular, so having him command his pitches is certainly a positive sign for the D-backs. Last season, Barry Enright made a name for himself in Arizona after his promotion to the Major Leagues in June. 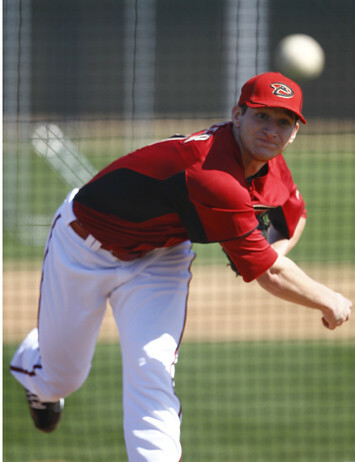 In 2011, Enright finds himself battling for a spot in the D-backs rotation and the right-hander certainly started Spring Training with a strong performance. 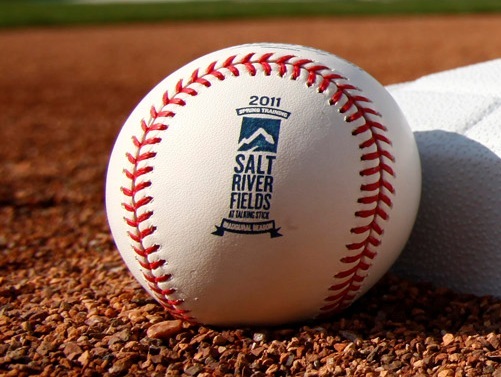 Enright made his Spring debut in the third inning of the D-backs’ 6-5 loss to the Rockies on Monday afternoon at Salt River Fields, and did not disappoint. In his first inning of work, Enright swiftly retired Dexter Fowler on a pop out to the catcher. Enright then showed off his glove work as he scrambled to haul in a ground ball off the bat of Jonathan Herrera for the second out of the inning. Enright capped off the 1-2-3 inning by inducing Charlie Blackmon into an inning ending ground out. In the top of the fourth inning, Enright returned to the mound and promptly retired Troy Tulowitzi on a line out and Todd Helton on a fly out to the shortstop. Chris Nelson stepped to the plate and smacked a double off the left field wall, but Enright rebounded by striking out Cole Garner to end the inning. While Enright fell behind a few hitters, he was able to fight back and avoid walking anyone. In the end, Enright posted an impressive final line of two innings, one strikeout and only one hit allowed. Like for many of his fellow pitchers, Enright enjoyed returning to competition. Following Enright, it was Jarrod Parker’s turn to make his 2011 debut. After missing all of last season due to an elbow injury and Tommy John surgery, Parker and the D-backs have long awaited his return to the mound. On Monday afternoon, the return finally arrived. In the top of the fifth, Parker retired the leadoff batter Matt Pagnozi via the strikeout. Parker did get in some trouble, issuing three walks in the inning. But with two outs and the bases loaded, Parker responded by getting Troy Tulowitzki to fly out to right field to end the threat. That would be Parker’s lone inning on the afternoon as he finished with three walks, one strikeout, and no runs allowed.